Nothing beats a warm movie night with your family and friends. 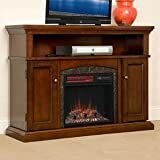 The easiest way to get this without depending on heavy blankets is by purchasing a fireplace entertainment center. Such a product will offer you the heat and fun you need for a cold night. Some of the best fireplace entertainment centers you should consider include the following. Walker Edison W58FP18ES Fireplace TV Stand, Espresso, 58"
This fireplace is beautiful, elegant, gorgeous, and sophisticated. It has a beautiful rich wood finish that features simple lines. The top features a mate-style design and this accentuates the beauty of the media console. There is the availability of shelves that give you storage for what you may need. The customized fireplace is remote controlled and it gives you the freedom to switch between the different flame colors as well as the brightness levels of the fire. There is also a safety plug technology that further ensures your safety when using this fireplace entertainment center. Style and simplicity define this fireplace entertainment center. Its elegance is undoubted. With the storage spaces it offers, you get a diverse and multi-functional product. Its construction is with excellent and high-quality products. It is constructed with particleboard and the finish is with laminated espresso. The open shelves will support your DVD, cable box, and so on. It can carry a weight of 70lbs. the fireplaces can be put on and you can choose whether it can produce heat or not. The dark walnut finish is perfect and this entertainment center will accentuate the beauty of your home. The fireplace has been wonderfully designed and lacks a vent. It uses gel fuel for burning that produces clean-burning flames that are real. There are two cabinets on the sides and shelves for your storage needs. It can carry a television weight of up to 100lbs. 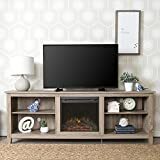 This is a modern fireplace entertainment center that has a beautiful cherry/black color that is attractive and enchanting. You can set up the ambiance with the flame whether it produces heat or not. The light source is LED and it offers up to 50,000 hours of life. The heat produced by the fireplace can be felt 400 sq.ft away. The cabinets are very large and the shelves are excellent. The top can hold a television that weighs up to 135 pounds and measures 70 inches. This fireplace entertainment center is breathtakingly simple yet elegant and with a touch of modernity. It is able to support up to 250pounds of weight and a TV measuring up to 70 inches. It is very flexible because the shelves are adjustable. This product features an electric fireplace and its installation is very easy. It comes when it is ready to assemble and the plug-in unit is very simple. The driftwood color is perfect; light and subtle. It is perfect for your home and gives off that calm and collected feel that allows for great relaxation during entertainment times. This fireplace entertainment center is elegant, simple, and sophisticated. It will accentuate the beauty of any room and blend perfectly with the décor. There are cable management holes that will in maintaining clutter-free space. The shelves are adjustable and are open. The construction was done using a high-quality MDF material that is durable and sturdy. The lamination is also excellently done. It is a highly fashionable entertainment center with great functionality. The heat emitted lasts for a very long time and keeps the warmth of your home intact. One thing about this fireplace entertainment center is that it is brilliant. The brilliance is seen in its design, development, functionality, and materials used. The infrared fireplace is energy efficient saving you on the electricity bills. The heat distribution covers up to 1000 sq.ft and it makes your home a bundle of coziness. It has a remote that helps to adjust heat, logs, flames, and downlight. The faux stone used is gorgeous and gives the feeling of the traditional fireplace. This enables this product to strike a perfect balance between traditional and modern design.The cabinets are LED lit and this beautifies the scene especially in the dark. This product can carry a television of up to 50 inches. 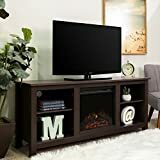 This media TV console stand with fireplace is perfectly compact and does not take up much space. It fits in a corner perfectly. The design and development are exquisite. It can carry a television measuring 48 inches and can support up to 250lbs. The brown color is perfect and can blend with your home easily. The electric fireplace easily and quickly warms up your home for long hours. There are enough shelves for storing a few things like your DVD, cable box, books, and so on. Its installation is easy and straightforward. You will not need professional help. This espresso fireplace TV stand is strikingly beautiful. It has spacious shelves that are open and you can store anything on them. The sleek finish is attractive and the product has great functionality. The top can accommodate TV measuring 60inches and can support the weight of up to 250lbs. It comes with an electric fireplace insert and the heat produced by the fireplace will keep you wrapped up in warmth for a very long time. This amazing fireplace entertainment center can heat up to 1000 sq.ft and it emits 5200BTUs per hour. The design is gorgeous and elegant. 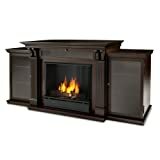 It has an ample storage and has an electric fireplace insert that measures 18inches. This product offers great adjustability and flexibility. Using the four-buttoned remote, you can easily customize the temperature as well as the color of the flame. It is a perfect investment and will beautify your home. These are some of the best fireplace entertainment centers you should be thinking about in 2019.